It is not only the recorders but the entire signal path we need to create to get the best looking video. We start out with a 10-bit TBC on the Ampex/Merlin Quad VTR. No other factory machine has a 10-bit TBC. This machine was totally rebuilt by Merlin Engineering in 1984 and any obsolete modules were changed out. So we start out with better video to send to the decoder. The decoder, an Accom D-Bridge, does an outstanding job decoding the analog video into component digital (SDI). We use an Accom DIE to reduce the noise and enhance the image. We can also correct the video brightness, contrast, color and phase to make the video look the best. The digital signal goes to a digital proc amp to make sure the video is within spec. We can make video adjustments at this stage also. Now the SDI digital video goes to the AJA Kona card for input into the computer. We use many different codecs from uncompressed 10-bit to ProRes, DNx, MPEG-2, H.264 and many others. We can also go to DVD and can even upconvert to High Definition with a Snell and Wilcox Quasar. If you don’t see your format listed, contact us. We are always adding more formats. 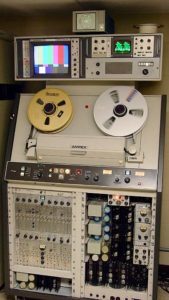 We use outstanding equipment like the Ampex VR-1200B Quad with Merlin Engineering Works modifications and NEC Digital TBC. I have completely restored several of these vintage machines in order to transfer old recordings for future use. We are always looking for new machines to add to our collection. Our business is designed to give users a way to migrate their Quad videotapes to a digital or optical format that can be played everywhere and saved for the future. 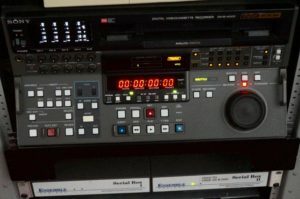 We can digitize your video at 10 bits for direct capture to a hard drive or for feeding Digital Betacam, DV or to DVD. For example, we can take Quad composite video to the Accom D-Bridge and decode it with 10-bit precision and output it at 10 bits digital for uncompressed capture using our AJA Kona Card/Final Cut Studio system. When it comes to 1″ recordings, there is one machine that is the king. The VPR-3. The finest 1″ VTR ever made. Complete restoration brought these giants back to original factory specs to give you the finest image and sound quality. With air guides to protect your master recordings, you can’t get a better playback. Plus, the Zeus 10-bit video processor/TBC removes video errors and enhances image quality. Contact us to find out just how reasonable our rates are! We’ve added several Sony BVU-950 VTRs to make the best 3/4″ transfers. With their built-in TBC and digital noise reducer, these best and last of the Sony U-Matic series machines make your tapes look fantastic. Noise and ringing are reduced, two of the problems inherent to many 3/4″ VTRs. They also play your SP tapes with outstanding quality. 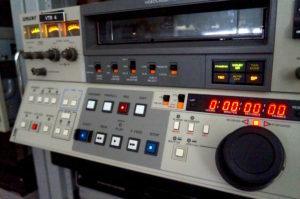 Using the Sony SVO-5800 to process playback of VHS and S-VHS, your tapes can’t look any better. This VCR uses luminance and chrominance noise reduction and digital luminance image enhancement. This VCR, added with our Accom noise reduction and 3-D digital decoding, gives you the best transfer. 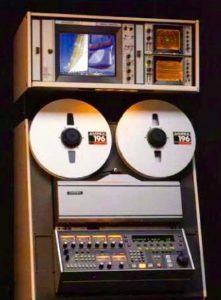 Sony hit a home run when designing the Digital Betacam recorder. Excellent image quality and four channels of digital audio make this machine a favorite. We have several units available to transfer. This A500 model even plays analog Betacam. My comprehensive services also include standards conversion to/from PAL/NTSC, High Definition upconversion to 1080i and 720p, video compression codecs – like ProRes, MPEG-2, H.264, IMX, DV, and uncompressed 10-bit with 24-bit audio. Editing services are available using Apple Final Cut Pro or Ampex ACE 25. Other formats are available; please ask for details. 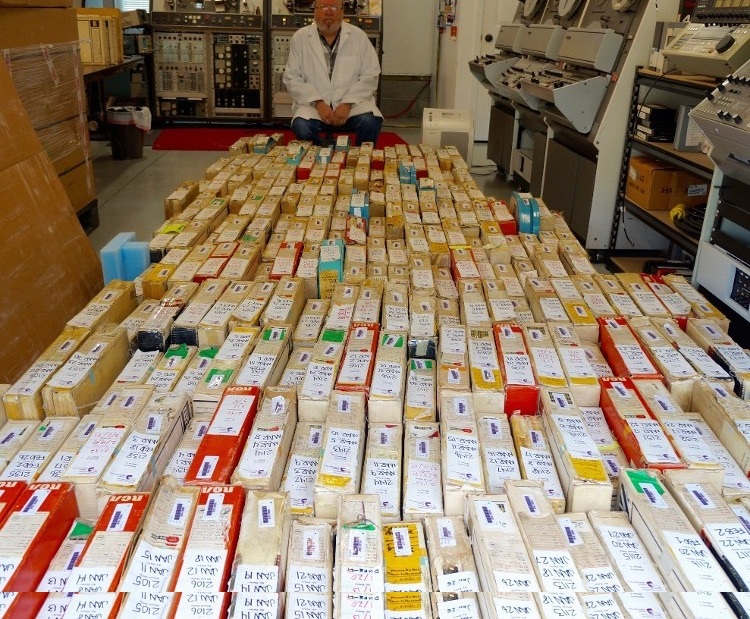 Park with many 2″ Quad tapes. 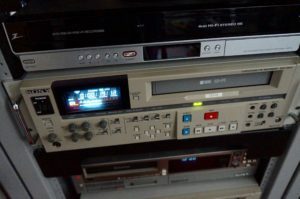 Here is a link for more information on video tape preservation. Verbatim M-Disc™ optical media is the new standard for digital archival storage. Unlike traditional optical media, which utilize dyes that can break down over time, data stored on an M-Disc is engraved on a patented inorganic write layer – it will not fade or deteriorate. This unique engraving process renders these archival-grade discs practically impervious to environmental exposure, including light, temperature and humidity. Designed for widely distributed large data such as scientific images, video and other commercial application object data, Verbatim M-Disc BDXL media have a storage capacity of 100GB – allowing you to use fewer discs while archiving your files.